NEW BRITAIN - As the end of the school year rapidly approaches, high school sports simply just turn over into another season. The CIAC gave people a glimpse of what to expect in the fall by releasing its 2018 high school football schedules Monday afternoon. New Britain will get a test right from opening night, Sept. 7, when it travels to Conard. The Hurricanes lost to the Chieftains 30-22 last year with both teams finishing around the middle of the pack in Class LL. After traveling out to West Hartford, New Britain will take on Manchester at home. Last season the Hurricanes won handily, 62-38. New Britain will then travel to South Windsor. After being on the road, the Hurricanes will play back-to-back home games against Simsbury and Southington. The Hurricanes and the Blue Knights could be a big match up. New Britain has not beaten the Blue Knights since 2011. The Hurricanes will get a week off on Oct. 12 before rounding out their second half of the schedule. New Britain will head out to West Hartford again, this time for a game against Hall in its first week following the bye. The Hurricanes will then close out the season with three winnable games before taking on Berlin in the annual Wishbone Bowl. First, New Britain will go head to head with Glastonbury on the road with home games against East Hartford and Enfield to follow. That leaves the Hurricanes with a Nov. 17 game on the road against the Redcoats at Sage Park. The last time the two teams met at Sage in 2016, the game was decided by a touchdown in overtime. Berlin will once again have an easy schedule through the first six weeks of the season, which should allow it to get a jump on a Class M postseason spot. The Redcoats start their season on the road on Saturday, Sept. 8, against the Bulkeley/HMTCA/Weaver coop that should allow them to get off to a strong start. The Bulldogs won just two games last season and lost to the Berlin 27-0 in the 2017 opener. 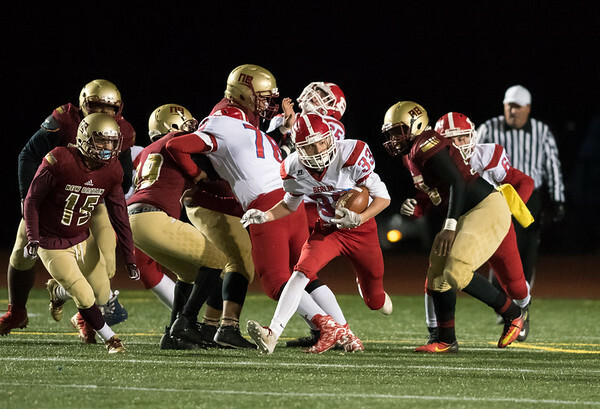 After hosting East Catholic on a Thursday night and traveling to Northwest Catholic for a Saturday morning game, the Redcoats will host rival Plainville. Last season Berlin beat the Blue Devils 42-14. The Redcoats will then travel to Avon for another Saturday game in Week 5, have its bye week and host RHAM before what will most likely be the team’s biggest test of the season with a brutal four-game stretch. Berlin will play both Tolland and Bloomfield on the road and will host Rocky Hill and the Wishbone Bowl against New Britain to end the regular season. Newington will open up its season at home against Amistad, a team the Indians have never faced before, on Sept. 7. Newington head coach Jason Pace had an opening during Week 1 and there weren’t too many other options available in terms of teams available to play. The Indians will then host Farmington the following week. After back-to-back road games against games against Platt and South Windsor, Newington will have a bye week before hosting both Bristol Eastern and Bristol Central. The Indians then begin a stretch of three consecutive away games against Middletown, Maloney and East Hartford before closing out its regular season with a much-anticipated matchup at home against Wethersfield. During the 2016 season, two teams ended their game in a brawl after the Indians fell by one, 20-19. During the 2017 season, the Indians had their redemption, beating the Eagles 17-13. Southington also looks to have a relatively easy schedule in 2018. The Blue Knights open their season at home against Glastonbury before back-to-back road games against Simsbury and Manchester. The Blue Knights will host Hall and travel to New Britain before entering their bye week. After the break, Southington will host Conard and then head to the road for back-to-back games against East Hartford and Enfield. The Blue Knights will round out their season at home. Before its annual Thanksgiving Day game against Cheshire, Southington will host South Windsor. The Bobcats will be a true test for the Blue Knights. Last season, South Windsor was one of the two teams Southington fell to and did so in overtime. Plainville’s program took a huge step forward last season, going 5-5 after having not won a game since 2015. The Blue Devils will have a tough test to start on the road against Bloomfield. The Warhawks picked up a narrow 18-13 win over Plainville to begin last season, en route to going 8-2. The Blue Devils will then have their first two home games of the year against Bulkeley/HMTCA/Weaver and Rocky Hill. Two roads games against Berlin and RHAM take them into the Oct. 12 bye week. Just two of the team’s final five games are away from home, East Catholic on Oct. 26 and the final contest of the regular season against Farmington Thanksgiving Day. Home games Oct. 19 against Northwest Catholic, Nov. 11 against Tolland and Nov. 9 vs. Avon account for Plainville’s other second-half games. Posted in New Britain Herald, Berlin, New Britain, Newington, Plainville, Southington on Monday, 11 June 2018 20:45. Updated: Monday, 11 June 2018 20:48.